Save $25 off $125 orders at Office Depot and OfficeMax with the use of the coupon code during checkout. For more information, please click “Redeem Now”. Offer excludes technology. Use the coupon code to get $40 off your order of $200 and more at checkout when you make the purchase at Office Depot and OfficeMax. Excludes technology, HP ink & Toner and Epson ink. Click "Redeem Now" to view the online site of Office Depot and OfficeMax and see more discounts. Use the coupon code at checkout to save 20% off your qualifying online purchase on Office Depot and OfficeMax. Excludes all technology, all ink & toner, all sale case paper and all sale cleaning and breakroom items. Limit 1 offer per customer. Click "Redeem Now" to view the online site of Office Depot and OfficeMax and see more discounts. Apply the coupon code during checkout to get 50% off online document printing at Office Depot and OfficeMax. Restrictions may apply. Click "Redeem Now" to enter the online site of Office Depot and OfficeMax and see more about the discount. Enjoy free Rachael Ray stoneware loaf pan with qualifying delivery order of $125 or more when you use the coupon code during checkout at Office Depot and OfficeMax. Exclusions may apply. Click "Redeem Now" to see more about the discount. Enter the coupon code during checkout to receive $25 off your purchase of $125 or more at Office Depot and OfficeMax. Offer excludes technology. Click "Redeem Now" to see more about the discount. Use the coupon code during checkout to enjoy free Nicole Miller umbrellas ($34.99 value) with $125 purchase at Office Depot and OfficeMax. Exclusions may apply. Click "Redeem Now" to enter the online site of Office Depot and OfficeMax and see more about the discount. Take 50% off Print on Demand at Office Depot and OfficeMax with the given coupon code applied at checkout. Start shopping and enjoy the discount by clicking "Redeem Now". Enjoy 25% off copy and print services at Office Depot and OfficeMax with the given promo code during checkout. Click "Redeem Now" to view more details. Apply the coupon code when you check out to get $20 off your purchase of $100 or more at Office Depot and OfficeMax. Offer excludes technology. Click "Redeem Now" to enter the online site of Office Depot and OfficeMax and see more about the discount. Apply the coupon code during checkout at Office Depot and OfficeMax to take 10% off your order. Excludes technology, HP ink and toner, and EPSON ink. To see more about the discount, click "Redeem Now". Take $10 off $75 at Office Depot and OfficeMax with the coupon code applied during checkout. Offer excludes technology. Press "Redeem Now" to view more about the offer. 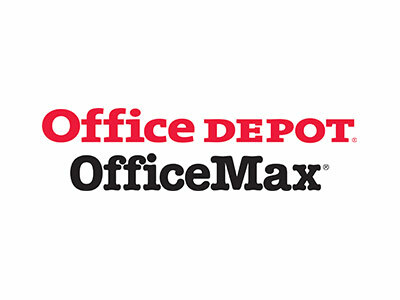 Enjoy $40 off purchase of $200 or more at Office Depot and OfficeMax. Excludes Technology, HP Ink and Toner, and EPSON Ink. Click "Redeem Now" to view more about the offer. Enjoy 2 free Fandango Movie Admissions with your qualifying online order of $125 or more at Office Depot and OfficeMax using the coupon code during checkout. Click "Redeem Now" to view more about the offer. Take 25% off one qualifying online item with given coupon code during checkout at Office Depot and OfficeMax. View more about the offer by clicking "Redeem Now". Get free $20 gift card with 2 Same Brand Toners Purchase + free shipping at Office Depot and OfficeMax with given coupon code during checkout. View more about the offer by clicking "Redeem Now".